2/8 Townshend Street, Phillip ACT. Opening and award presentation: Saturday, 17 September from 2-4pm. The Entry Application Form must be completed and delivered to the CAW Studio by Monday 5 September (box on counter). UPDATE: Entry is now closed. Thanks to all participants. Your Works and Payment must be delivered to Canberra Artworks, 2/8 Townshend Street, Phillip on Tuesday 13 September between 10am – 5pm. When you deliver your work, the ID tag sections of your Entry Form will be cut off and attached to each work. 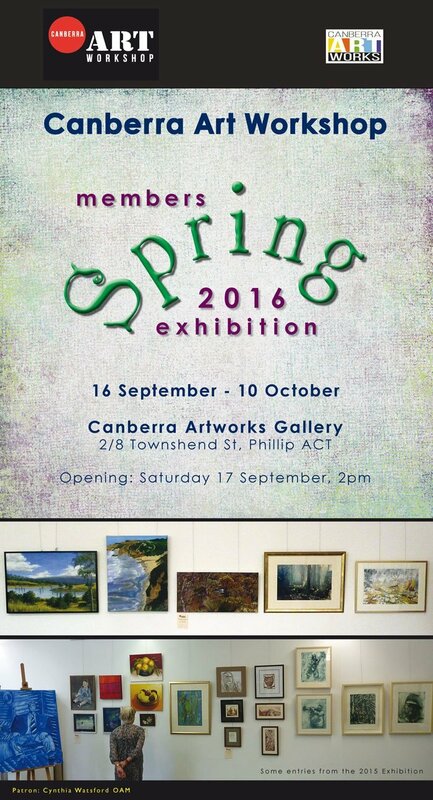 Works must be picked up from Canberra Artworks on Tuesday 11 October between 9am – 5pm. ID required. Entry forms are available in the CAW studio or download: 2016 CAW Exhibition Entry Form. Please read and follow instructions carefully.